Description If this nebula were at the location of the Orion Nebula (M42), it would fill the whole constellation and cast a shadow ! It is the only extra-galactic nebula that can be seen with the unaided eye as a faint patch of light on the eastern end of the Large Magellanic cloud (LMC), 160.000 light years distant. The "body" of the spider contains a very dense concentration of extremely hot giant stars that excite the hydrogen gas around. The prominent open cluster towards the bottom is NGC 2100. Many other young star clusters can be seen as well as several dark clouds. 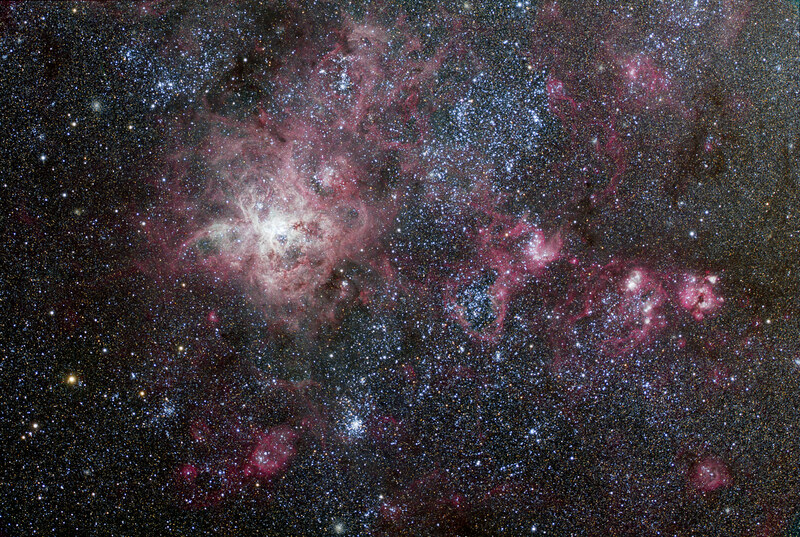 The dense star field of the Large Magellanic Cloud can be seen starting towards the right (south). This rich extragalactic scenery covers a field of view of 75 x 52 arcminutes or approximately an area on the sky the size of four full moons. Click here or on the image for a higher resolution version. There is also a Ha narrowband version in the light of hydrogen alpha. Earlier images of the Tarantula taken with a 10" Maksutov-Newton telescope and a 14.5" Ritchey-Chrétien.